First came the motorbikes – dozens of them, riders waving. Then the police cars, official vehicles – BMWs galore – and more motorbikes. 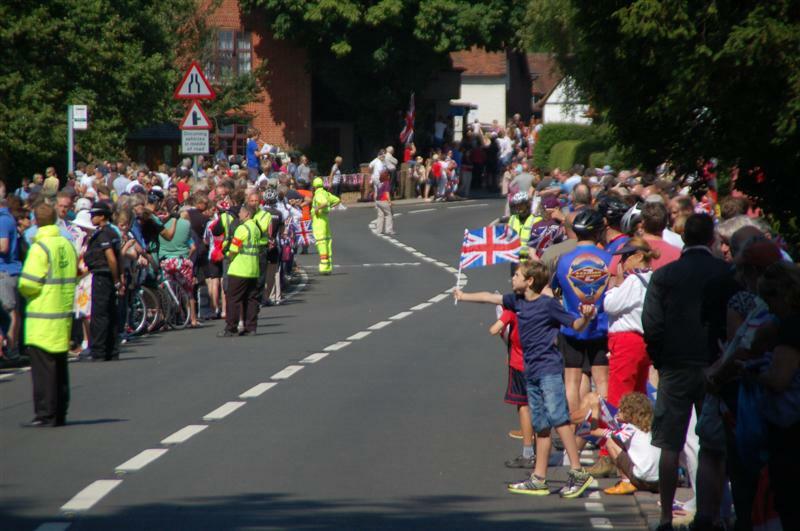 By the Kingfisher Farm Shop at Abinger Hammer, and opposite the village shop, by the Tillingbourne stream, hundreds of locals crowded the roadside. We perched on a wall, having arrived sedately by bike from Peaslake, a couple of miles away. A man nearby was picking up live reports on his smartphone and announcing the latest. An official vehicle equipped with a loud-hailer cruised by, confirming his news that there were four minutes between the leaders and the next bunch. “How does the race work? 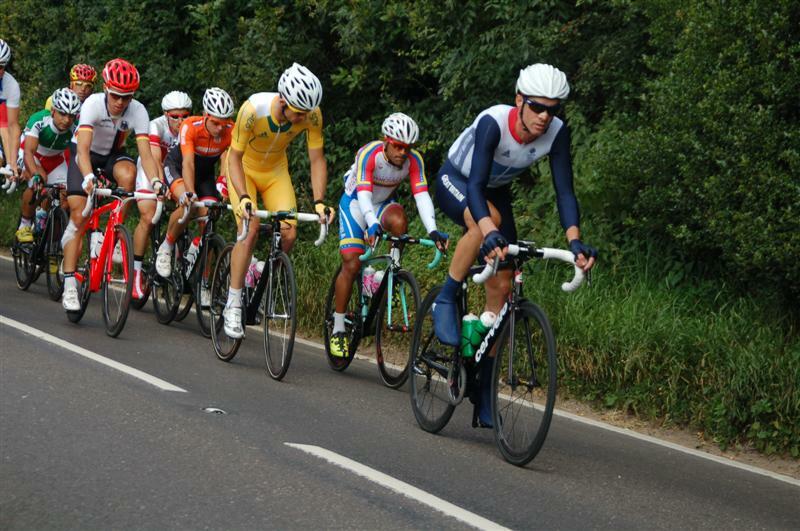 Is it timed?” a woman asked a pair of cheery, lycra-clad road-bikers who had pedalled over from Farnham with a picnic. First past the post, they explained patiently. Finally, at 11.25am, they came. So quickly I hardly clocked them. Four minutes later, as promised, a second batch passed. At last, some action. But which GB-er is it? This time, we caught sight of the Team GB suits but failed to spot those all-important side burns that belong to both Mark Cavendish and Bradley Wiggins. 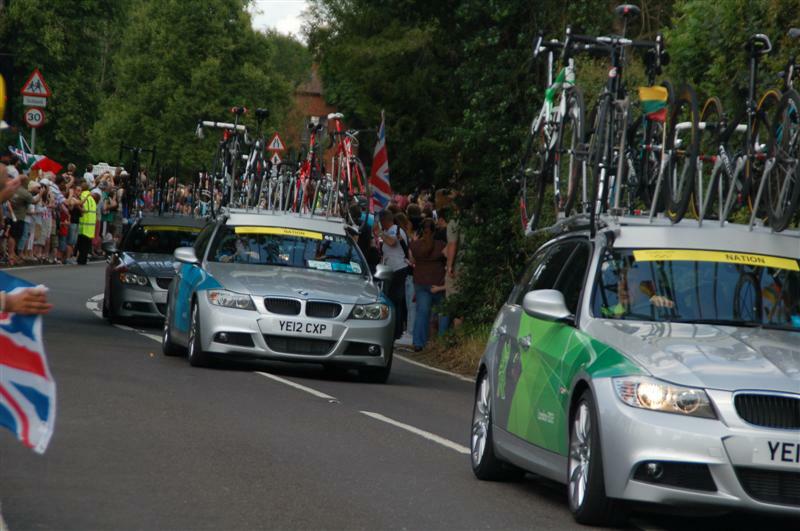 Then they were gone – and along came dozens more Beamers, who looked like they were having their own road race at least as hairy as the two-wheeled one. Then minibuses full of press – and it was over. As they pedalled on to do nine circuits of Box Hill – where Mark & co are closing on the pacemakers as I write – we stocked up on chutney and sausages at the farm shop before meandering home.